The BBC and ITV are to launch Freesat, a free-to-view satellite service, in 2006. The announcement follows the launch of BSkyB's own free satellite service - Freesat from Sky - last October. Freesat will enable people to access all BBC and ITV digital TV channels plus interactive and radio services via a satellite dish. It will follow in the footsteps of Freeview, the free-to-air digital terrestrial service that currently reaches more than five million homes. Freeview was launched in October 2002 as a replacement for ITV Digital. It allows viewers to access more than 50 channels by purchasing a set-top box for a one-off fee of around £50, which will work with a regular terrestrial viewers. WHO WOULD SIGN UP FOR FREESAT? Approximately a quarter of TV viewers live outside the Freeview coverage area. Signing up for Freesat will ensure viewers have access to digital services when the government begins to switch off analogue TV signals. Freesat will initially carry all ITV and BBC free-to-view digital services, in addition to dozens of other free-to-air channels. WHAT ABOUT VIEWERS WHO ALREADY HAVE A SATELLITE DISH? ITV currently encrypts, or scrambles, its transmissions via satellite, using the service provided by Sky. In the next few months, ITV will begin to broadcast its channels "in the clear" - without encryption - so they can be watched through any satellite receiver. The BBC started doing this in 2003. Viewers will require a Freesat box in order to obtain the services. It is hoped the system will be compatible with existing satellite dishes. 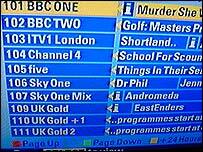 HOW DOES THE BBC AND ITV'S FREESAT COMPARE WITH FREESAT FROM SKY? Freesat from Sky offers 140 channels for a one-off fee of £150. Viewers get a digital set-top box, satellite dish with free installation and a remote control in the deal. It is not yet known how many channels will be available via Freesat, or how much it will cost to get Freesat equipment installed. However, it will allow the BBC and ITV to supply their services directly to consumers without the broadcasters having to pay Sky to encrypt their programmes. If Freesat - which is a working title for the service - takes off, the likes of Channel 4 and Five may well be tempted to join, which could mean more channels join Freesat's line-up.